and the area is known as the Ming Tombs. 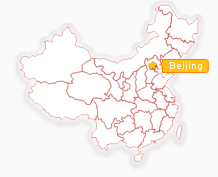 Beijing served as the national capital during the Yuan, Ming and Qing dynasties. Unlike Ming and Qing rulers who all built massive tombs for themselves, Yuan rulers left no similar burial grounds. Why the difference? This has to do with peoples different views on death. Beijing nomads came from the Mongolian steppe. Mongols who established the Yuan Dynasty held the belief that they had come from: earth. they adopted a simple funeral method: the dead was placed inside a hollowed nanmu tree, which was then buried under grassland. Growth of grass soon left no traces of the tombs. By contrast, during the Ming Dynasty established by Han Chinese coming from an agricultural society in central China, people believed the existence of an after-world, where the dead lived a life similar to that of the living. Ming emperor, therefore, has grand mausoleums built for themselves. Qing rulers did likewise. From the Yongle Emperor onwards, 13 Ming Dynasty Emperors were buried in the area now known as the Ming Tombs. The tombs of the first two Ming Emperors are located near Nanjing (the capital city during their reigns). Emperor ChongZhen, who hung himself in April 1644, was the last to be buried here, but on a smaller scale than his predecessors. The Ming Tombs form the most extensive burial complex of any chinese dynasty and are one of the finest preserved pieces of 15th century chinese art and architecture. The Ming Tombs were listed as a UNESCO World Heritage Site in August 2003 along with other tombs under the Imperial Tombs of the Ming and Qing Dynasties designation. The site of the Ming Dynasty Imperial Tombs was carefully chosen according to Feng Shui principles. Accordingly, bad spirits and chilling winds from the north must be deflected. An arc-shaped area at the foot of the JunDu Mountains (the southern foot of TianShou Shan) was selected. This 40 square kilometer area - enclosed by the mountains in a pristine, quiet valley full of dark earth, tranquil water and other necessities as per Feng Shui - would become the necropolis of the Ming Dynasty. The Ming Tombs are constructed in conventional fashion, with memorial halls at the front and burial chambers to the rear. Indeed, many of the buildings here mirror Ming palaces found in the city. The entire Ming Tombs site is surrounded by a wall. And a seven kilometer road named the Spirit Way (or Spirit Way), also called Sacred Way, leads into the complex. The main entrance to the valley is the Da Hong Men (Great Red Gate). Constructed in 1540, during the Ming Dynasty, this memorial archway is the earliest and biggest stone archway existing in China today. Further in, the ShenGong ShengDe Stele Pavilion can be seen. Inside it, there lies a 50 tonne tortoise carrying a stone tablet. The pavilion was constructed in 1435. The stele records sacred merits and lofty virtues. The front bears an inscription by Emperor RenZong (1378 - 1425) noting the great achievements of Emperor YongLe, who was buried in ChangLing. A white marble HuaBiao (ornamental pillar) is positioned at each corner of the stele pavilion. At the top of each is stationed a mythical beast facing either inward or outward, expressing hope that the emperor will neither cling to the palace nor forget to return to the Palace to handle state affairs. Leading to imperial tombs, there is usually a Sacred Way, which means the road leading to heaven. The emperor, known as the Son of the Heaven, would return to Heaven through this road. Among the many Sacred Ways, the one at the Ming Tombs is the best preserved and most complete. The Sacred Way (Shen Dao) is not to be missed. The path, slightly curved to fool evil spirits, is lined on either side with willows and remarkable carved stone animals and human figures, considered among the best in China. The statuary along the Sacred Way includes pairs of camels, lions, elephants, and mythical beasts, such as the qilin, a creature of immense virtue referred to as the chinese unicorn even though it has two horns. The stone statues along the Sacred Way are important decorations of the mausoleum that form a guard of honor. These statues are usually 12 human figures (including the general, civil officials and meritorious officials) and 24 animals. The animals are the lion, camel, elephant, xiezhi (a mythological unicorn), qilin (one of the four divine animals, the other three are dragon, phoenix and tortoise) and horse. The main Sacred Way was built to lead to the ChangLing mausoleum. The statues here were erected between 1436 and 1438. Afterwards, twelve more mausoleums were built. The other Sacred Ways here are branches of the ChangLing Sacred Way. ChangLing is the largest and best preserved of the 13 Ming Tombs near Beijing. ChangLing, 4km (2 1/2 miles) from the entrance, is the tomb of Emperor YongLe (reign 1403-1424) and empress XuShi. The layout is identical to the tomb of the first Ming emperor in Nanjing and is rather like the Forbidden City in miniature. In addition to the palace, there is an underground burial chamber. In total, the structures at ChangLing occupy an area of 120,000 square meters. Most striking is LingEn Dian, an immense hall in which the interior columns and brackets have been left unpainted, creating an eye-catching contrast with the green ceiling panels. The Dingling Tomb is the tomb of Emperor Wanli (reigned 1573-1619), the 13th emperor of the Ming Dynasty, whose personal name was Zhu Yijun, and of his two empresses, Xiao Duan and Xiao Jing. The tomb was completed in six years (1584-1590), it occupies a total area of 1,195 square meters at the foot of Dayu Mountain southwest of the Changling Tomb. The underground palace at Dingling Tomb consists of an antechamber, a ceniral chamber and a rear chamber plus the left and right annexes. One of the pictures shows the central chamber where the sacrificial utensils are on display. Two marble doors are made of single slabs and carved with life-size human figures, flowers and birds. More than 3,000 articles have been unearthed from the tumulus, the most precious being the golden crowns of the emperor and his queen. Outside Ding Ling, behind the ticket office, is the new Ming Tombs Museum, with short biographies of all the entombed emperors, a large number of cultural relics recovered from the tombs, and a detailed wood reproduction of the LingEn Dian.